Friday we spent the whole day with our friends David & Michelle and their daughters Abby (almost exactly a year older than Nina) and Julia (just turned 1). It was a wonderful, relaxing, happy day. They live in Oak Park, which is where I lived when Larry and I started dating. It borders on the city and is like a small town close to the city (two of the train lines go there, as well as one of the commuter lines). There's a Whole Foods, lots of independent shops and restaurants, and many, many Frank Lloyd Wright houses. Most homes in Oak Park are Victorian, Arts & Crafts, or Prairie style. Larry took the two older girls to the library while I poked around some shops, Michelle had a much needed nap, and David had a massage. It was really nice to get a little time to myself (I went into the Borders where I used to work and the woman there asked me if I wanted a rewards card; I told her that I didn't have enough alone time to go to bookstores). I picked up some plane treats (including this book which I will save for another occasion) and recharged a little (couldn't be complete without a trip to Paper Source), then picked up Larry and the girls from the library. This library was nice when I lived there but it has been renovated and is now stunning. We ordered some dinner from a Middle Eastern place (mmmm, falafel) and then Michelle drove us back into the city. It was a magical, refueling kind of day. Saturday we woke up and checked out of our hotel, leaving our bags there so we could walk around the city for a while. We checked out the Lincoln Park zoo, which is really good and also free. It's really amazing that is is so close to downtown and also free. It started to feel like lunchtime, and I remembered that there was one last restaurant I wanted to hit...and it was in within a few blocks of the zoo. It doesn't seem to be in the Lonely Planet guide that I got from the library but it really should. It's called Chicago Pizza & Oven Grinder and it has a pretty unique menu, including the pizza pot pie and the mediterranean bread, both of which are delicious. We walked back to the hotel where our luggage was stored to allow Nina a chance to nap. We were flying out of O'Hare this morning so we spent the night in a hotel closer; it's a bit far from downtown. After a good night's sleep we got on the plane and headed home. My mom picked us up at the airport and we stopped by Blue Water for takeout to avoid having to cook dinner. It's nice to be home. Stay tuned for pictures and thoughts on the trip. We went to the Shedd Aqurium yesterday, which was challenging and fun. We got there at around 10 and had to wait about an hour to get in, and we were in the stroller/wheelchair line; the other line was enormous. While in line we befriended a woman who turned out to be from China and talked about children (hers is 2), the Olympics, and lots of other things. She told me that she had been buying a lot of gifts for her son who she had left behind in China and was missing terribly. Though I mentioned it, I think the irony was lost on her that probably a lot of the things she was buying her son were made in China; in fact she works for a company that distributes stuff from China to big stores like Wal-Mart and Target. She didn't know she was in a special line so I brought her in with me, which she appreciated. Anyway, the aquarium was awesome and we headed off immediately on entry to see the Beluga whales; they are really amazing looking and there was a cute baby. Lots of mammals, birds, and fish later we went looking for food and ended up in the food court, where I asked Nina if she would like a sandwich. Apparently at that juncture a sandwich would have killed her, so I instead ordered a burger and fries. As soon as the burger and fries were placed on the tray, Nina decided that a burger and fries were now deadly and to be avoided at all costs, and in fact now only a sandwich would do, we're talking life and death here. Since I was only buying one meal to split, that was now out of the question, which you can imagine made for some drama, and I'm not big on giving in to avoid drama. Now, about once every few months Nina throws a real tantrum and apparently this was to be the magical day. And, as you may or may not know it is hard to push an umbrella stroller and carry a cafeteria tray with a soft drink and a meal balanced on it. Add in a child in tantrum trying to knock the tray out of your hand because she is pissed off and you can imagine the results. I was lucky that there was about half a drink left and that the burger was lifted slightly off of the surface of the tray in a basket. It was mostly edible, amazingly. And to tell the truth, it was so loud in there that I couldn't hear it and for me the tantrum is much less stressful if I can't hear it so well. After about five minutes I stopped being bummed out at her for being unreasonable (I know, she is three) and was able to hold her and she spent some time calm with little bouts of sad resurgence. In one of those I pointed out the fries, which was the end, she perked right up and ate some burger and fries and all was good in the world. And you know the good thing about those tantrums? It's exhausting to really put everything you have into them and immediately after a long nap is required. We had taken the train to the aquarium but I decided to walk back to the hotel along the lake (remember the burger and fries? I ate at least half). It took an hour or so but we took a turn through Millennium Park, which I can honestly say is much nicer when it's warmer out. If you have walked with me you know I set a nice brisk pace so I was stripped down to a sweater and it was a really lovely walk with Nina sleeping in the stroller. I also got to take pictures of my favorite building in Chicago (I have been taking pics the whole time but don't have a card reader here so they will have to wait until we get home). A quick trip to Whole Foods for some sinusalia (so far it's working for the sinus infection I seem to have) and then we had to scoot out to dinner. Larry had arrange to meet some friends for dinner at out favorite Chinatown restaurant, Penang; our friend Peter's wife is from Malaysia so he ordered a bunch of stuff and we just feasted, it was an excellent meal. In attendance were Alex, Paul, Peter, and Carlo, friends of Larry's through math at UF and UofC. Afterwards we went to a reception at the home of George and Roza Glauberman. George was PhD advisor to Larry, Paul, Alex, and Carlo and the conference they are all attending (and the reason we're here) is in honor of George's birthday. Today we were going to hit the Lincoln Park Zoo but when we got off of the train it was sleeting and we decided that an outdoor activity was a bad idea in the weather so we headed to the Field Museum, where we saw Sue and a lot of other really cool stuff. Two days a year the Field Museum closes at 3pm and is open only to members and today was one, so after eating a late lunch there we headed back, along the lake again, only this time in some snow. For those of you not familiar with the area, the Field Museum, Adler Planetarium, and Shedd Aquarium are all on "Museum Campus" so it was the same walk as yesterday, only this time the top half or more of all the tall buildings were shrouded in fog. Nina slept again, but not for as long because I had forgotten the rain cover for the stroller; she was a bit soggy and cold as it was still precipitating off an on. Plus the no exhausting tantrum thing. Larry and Nina headed off to Navy Pier when he got back from the conference; they had a fun evening at the Children's Museum, from what I hear. I decided not to join them; instead I went to Whole Foods and bought a bottle of kombucha, a spicy salmon roll, and a pint of organic strawberries. I brought it back to the hotel and had a nice dinner ALONE. I was excited to watch LOST on an actual TV (in HD, no less) but it was a re-run. Very frustrating. Oh, and for the record, Nina could not care less about snow. I pointed it out to her as it was falling from the sky and she seemed not to notice that it was different than rain. The only excitement I have gotten from her about it was when we first got here and there was a little left on the sidewalks from a storm, and then she wanted me to run over it with the stroller wheels. We got to Chicago on Saturday night after a fairly easy flight to Denver and then a connection to Midway airport. In Denver, Nina was starting to get a little crazy, so I asked her if she needed to take a nap; she said yes and after a brief stroll, she fell asleep. Just in time to board the plane to Chicago. I carried her on asleep and buckled her in and she slept for about an hour all curled up in the seat with a coat over her. We took the train to our friends' house and had a lovely dinner. Sunday we spent preparing for the party our friends Miriam & Ben threw in our honor, which was wonderful because we got to see some good friends. Our Israeli Jew friend even brought the components to make traditional Polish easter eggs. Go figure! Monday we moved to a hotel and Nina and I spent the day looking for gloves, with no luck--everyone has cleared them out to make room for spring clothing, though it's still pretty cold here (with the wind chill it was around 30 degrees on Monday, though I walk pretty fast, so I wasn't usually too cold. We ate lunch at Potbelly and brought in dinner from Pizzeria Due, which is Pizzeria Uno, it was just the second restaurant they opened. When I have had Chicago deep dish pizza, it has always been from Giordano's, but the Due pizza was pretty much the same. I still prefer New York style, though. Today our friend Karen picked us up in her car and took us to the National Museum of Mexican Art (we gave her a choice of that or the Nortbaert Nature Museum and she chose art), with a stop at a playground. Then we headed Mundial Cocina Mestiza for lunch. Then back to the hotel for a little down time, and on to American Girl Place. I had told Nina I wasn't going to buy her anything, so it went pretty well and was fun to look at the dolls and their accessories, though it was hard for me not to pick up a little something for Shelf (yes, her name is Shelf now, not Beep). Nina is sleeping now so I'm going to relax as well. Not sure where dinner will be, but our plan is to hit Margie's for some ice cream after. We haven't vaccinated Nina yet, and a lot of people we know haven't either. Some of our friends were interviewed for the Today Show; here's the clip. for lack of content lately. I hope this makes up for it a little bit. The first was mayonnaise. I have tried to make mayo a few times before, all with unsatisfactory results. Too runny, too solid (made with olive oil), not tasty, etc. Mayo is tricky because it can so easily be just some oily egg yolk. So when I saw the link on Tastespotting for homemade mayonnaise without tears, I was intrigued, enough so to actually try it. And boy am I glad I did, it turned out so amazing, so tasty on sandwiches, etc (the final test will be deviled eggs, which I will make soon). Of course I deviated from the recipe a little because I don't have a hand blender--I used the whisk setting on my stand mixer, and transferred the first mixture into another bowl to do the second. And, of course, I don't have a plastic squeeze bottle, so I used an empty glass hot sauce bottle. And I added whey, a la Nourishing Traditions, as a preservative, and left it out overnight. I might have added a little too much whey and next time I will use apple cider vinegar instead of rice, to give it a little more punch without watering it down so much, but overall I am deliriously in love with this recipe. Oh, and this time I used untoasted organic sesame oil. The second was pita bread, another link from Tastespotting; it's definitely a daily must-read for me. The only thing I did differently from the recipe is that I did the sponge, kneading, and the rise in the bread maker, and I didn't let the cooked breads cool before wrapping them up with a towel. I found that wrapping them up with their friends right away made them softer and more pliable. Delish. We finished the pitas last night when Nina asked me if we could make pizza. Note that she asked if we could make pizza, not order it. So of course I said yes. I was going to make dough but I was up against a deadline and also wanted to go out knitting last night. I knew it would be tight letting dough rise, then baking, etc, by 5 pm, then I remembered the pitas. Easy! Just smear on some sauce (I reduce regular spaghetti sauce to make the pizza type), grate some cheese, then let the toddler put handfuls of it on top. I was enough in a rush that I didn't even insist on putting greens on it. It was a hit, I made my deadline and got out of the house in time to knit. All around success! If you try either of these recipes, let me know how they turned out. But not without a lot of help. Nina and I kicked off our week alone together by going to a wonderful birthday party for Lucca. The food and company were wonderful and I left feeling like I could do it. Well, first Nina had to pee in the back of Kelli's car, just like Oli. I swear I had a pic of Oli using the potty her mom keeps in the back of her station wagon, and it would have been good to insert here, but I can't find it. Sunday we called Mima and Rochelle and asked them to go for a hike with us. 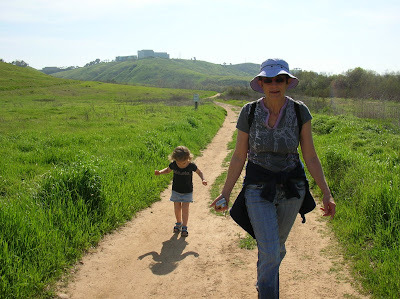 We went to Los Penasquitos Canyon Preserve and went for a 6 mile hike. Tessie the chihuahua walked the whole way and Nina walked for at least a mile of it, she was a real trouper. We did not see a single other person hiking that day in a mini skirt and Marc Jacobs shirt. Monday we met up with some friends at a park, which I passed off to Nina as playgroup, though we didn't go to our usual one. Then we had lunch at Whole Foods, went to Costco, and headed home from nap. After nap a friend cooked us dinner. It was an amazing Indian meal, daal, tandoori chicken, raita, and basmati brown rice. And her husband stopped at a restaurant and got some naan to complete the meal. Nina snarfed it, and with good reason, it was delish. She also played really well with my friend's daughter, though at playgroup they've never really had much interaction at all. Tuesday Nina had school, we went and bought a gazebo for the back yard (I'll post a pic once it's assembled), then I haven't the foggiest idea what we did all afternoon, except that we both survived it, so it couldn't have been all bad. Wednesday I woke up grumpy and having my keyboard and webcam not work at the same time was so frustrating, especially when I was trying to skype/IM Larry halfway across the world. The keyboard could not be saved, I had to get a new one. The webcam required me to reinstall the driver every time I unplugged it from the usb port. Did I mention that it was frustrating? Having the keyboard not work enabled me to free up a usb port that the webcam can have permanently so I don't have to reinstall again. My mom came and rescued Nina from me, and also gave me a new keyboard that doesn't use a usb so it's all good again. She also fed us a Brazilian fiejoada and patacones. I brought the farinha de mandioca (manioc flour) for farofa and a feast was had by all. Nina had not napped at my mom's house and so we got her into her pj's and by the time we were home she was this close to being asleep so I drove for another 5 minutes, which totally did the trick. So I think we're going to make it (Larry comes back in the evening on Saturday), and I even had two culinary triumphs, which I'll tell you about soon. I'm having a pretty fun time here in England modulo some surly waiters. The breakfast at the hotel was fabulous (and the people were cheery) and there were a couple of really good talks at the conference today. It's all so much better though because I've been able to stay in touch with Lorien and Nina through Skype. 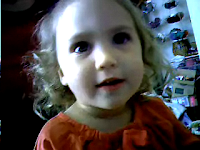 Here's a picture of the little one captured from Skype. Pie chart of things Rick Astley would never do (very scientific). The computer say it's almost 5 am in San Diego right now so that means I woke up 24 hours ago. That was after Wannabe Hippie's husband's 40th birthday party and then the last minute packing on Friday night. But it was all part of my plan to force myself to sleep on the red eye out here. I flew on Continental which has been advertising that they still give you food at meal times. I had a wonderful second breakfast on the flight to Newark; I had signed up for the kosher meals because I think it's always a good idea to get a special meal and I'm not really sure why I picked kosher over vegetarian. Anyway, it was an excellent egg with cooked vegetables, very hot. I slept a couple more hours on the flight, skipping "Becoming Jane" and got into Newark at about 4pm. I'd arranged to meet my friend Judd in the city of Newark; he took the PATH train from NYC and I took the NJ Transit from the airport. There was a train at 4:25 and I got to the station at 4:27 but people were still waiting for the train. It never came so I got on the 5:05 for the six minute ride into the city. While I was waiting for the train, a big, pretty snow flurry kicked up. It was the first snow I'd seen in maybe six years and I was sitting in the nice warm waiting area watching it, so that was all good. We took the train a lot when we lived in England and it was almost invariably within five minutes of the schedule. One day there was a lot of trouble with the tracks and all of the people waiting on the platforms got regular updates on when the train was expected to arrive. It is inconceivable that a train would be at least 40 minutes late and no one would provide any information. I don't know if we have bad train service because no one rides the trains or if no one rides the trains because we have bad train service. Anyway, Judd and I had dinner at a place called Mix27 in Newark. He had checked out restaurants near the train station, which was very nice. We got there and the place was empty, which I thought might be a bad sign, but within 15 minutes every table but one was taken, which I thought was strange. The food was actually quite good; the only complaint I have is that they brought me the appetizer sized portion of my mushroom risotto when I definitely ordered the entree. Judd had a nice looking sandwich. If you search for "Judd Blaise" on IMDB, you'll find he's got some credits in the editorial department and recently has an Editor credit as well as one for Cinematographer. It also tells me his StarMeter is up 91% in the last week. Way to go Judd! The train ride back to the airport was uneventful and there was essentially no line at security. We didn't board for our 8:55 flight until about 8:45 so I still ended up spending maybe 45 minutes waiting in the airport which I really hoped not to do because I ended up getting an ice cream cone at Ben & Jerry's. The flight was fine, less than half full so I had a whole row to myself and slept a fair amount. This time I skipped the movie "The Jane Austen Book Club." I could have had a very Jane Austen day. She spent some time living in Bath, which is the next town over from Bristol and which is almost a character in "Persuasion", my favorite of her books. The flight came into Bristol. I was sorry to see that they now charge a pound to use the luggage trolleys. I got picked for a random search of my bag by the customs people. I ended up missing the first bus to the train station but caught the next one. From there I bought my ticket to Cheltenham, the town where my meeting is this week. There was a train leaving in about five minutes, it left essentially on time, and took about an hour, I think, to get me here. A good train system really does make things easier. In fact, all the travel went so smoothly that I arrived at something like 11:15 (= 3:15 San Diego time)and I wasn't supposed to check in until 2. A bus to the city center arrived while I was looking at my map outside the train station. I guess I'm going to keep harping on how convenient the public transportation is here. However, I had been planning to walk to the hotel and I stuck with that plan. I did alter the plan by getting on to the walking path that was right outside the train station but not on my Google map. I think that it was slightly out of the way but it was very pleasant; there were people walking dogs, kids playing, people on bikes. It was just a very nice walk. Eventually I asked for directions to Suffolk Square, where my hotel is. The guy said it was quite far, definitely more than a mile. I don't know if he thought that was a far walk ordinarily or just because I was wheeling my suitcase. Anyway, it was a pretty quick walk and I got to the hotel a little before noon. I found someone who found someone to get me checked in. I'm staying at the Willoughby House. I think this Willoughby has no connection to Jane Austen. The house was built on Suffolk Square in 1824 after the Earl of Suffolk died and his daughter sold some land. According to the book here, "It was to Willoughby House that the future Queen Adelaide, wife of King William IV, came to dine in 1837. She also visited Willoughby for afternoon tea on several occassions." The place is very nice and I think I'm in for a pleasant week. Lorien and Nina, I love and miss you dearly. I love The Wind in the Willows by Kenneth Grahame, if you haven't read it, go ahead and at least check it out of the library. It's the story of a mole who befriends a river rat and their adventures together. Another character is Toad, on whom the Disney "wild" ride is based. Maybe it's just because I read it and listened to a dramatized version on the radio when I was little, but it holds a special place in my heart. A few years ago I found this beautifully illustrated (by Inga Moore) version on a bargain table in a bookstore and snapped it up. Much to my delight, it has become the first book that Nina and I are reading together as a chapter book, a few pages at a time. It's long and it has chapters and she really seems to be following along. I have to find that version I listened to when I was little now, it was wonderful. 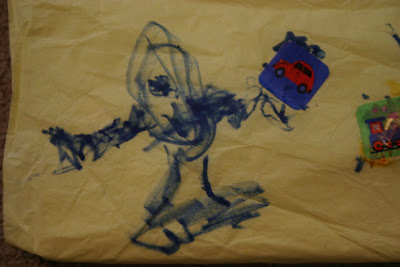 We're going to a birthday party today and Nina helped me wrap the present (I wrapped and she placed the tape and drew on the paper). I didn't think much about or study the drawing too closely until Nina told me what it is. Can you guess? It's a person on a skateboard! I have been thinking she's almost ready for her first board. Do they make tiny ones for the under 5 set?